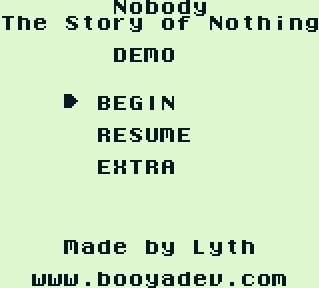 Nobody - The Story of Nothing is a unique text based, minimalistic, "choose your own adventure"-type game for the Nintendo Gameboy. It's written in ANSI C and uses GBDK as the compiler. Who are you? You are Nobody. What are you? You are nothing. What will you become? That remains to be seen. 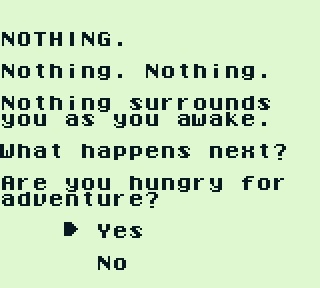 Will you stay nothing? Possibly. Will you become Something? Maybe... if that's what you wish. In this game you are not a person, instead, you are an entity. You are not living, nor dead. Foxlet - Provided development assistance, code tweaking and artistic ideas.